Mathieu Imbert's Blog | I am a PHP guy, I love coding, playing around with libraries, frameworks and other languages too. 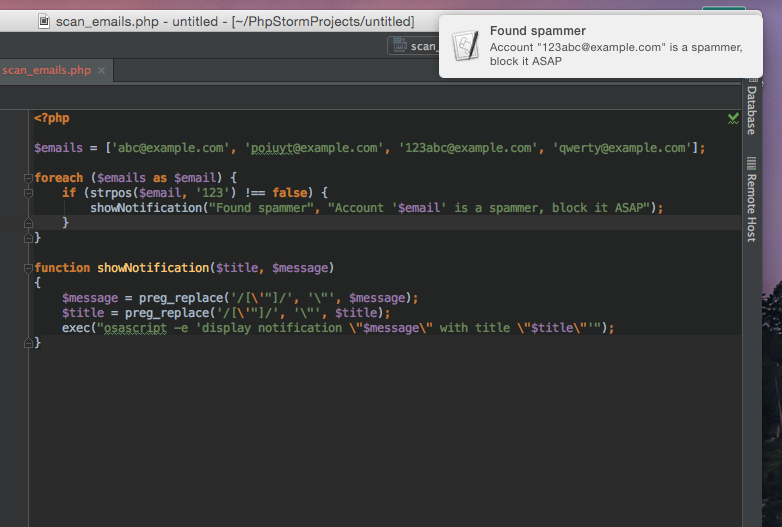 In one of my work project I have bug spam issues. Fake user accounts created by bots and scripts, spammy comments, spammy content, … I built scripts to help me detect spammy patterns, and I run them from my iMac. The process usually take a while, somewhere between minutes and hours. To see the results, I can wait until it finishes and then process the reports, I can send myself an email every time I detect a spammy pattern. I was looking for a better solution, without having to keep my eyes on the console. Since I’m using OS X, I thought it would be cool to use the same notification banner used by the Apple email program, and various other software for OS X. Recently I came across an issue that was harder than it seemed. I use my own framework, which is based around Symfony’s HttpFoundation. So unless you want exponential and half pages, it doesn’t work. I really though this one would work, until I realized page 1 was broken. Because when I get the ‘page’ parameter with $page = $request->query->get(‘page’, 1); I can get 2 variable types. If ‘page’ is defined, $page will be a string, if ‘page’ if not defined, it will default to ‘1’. Which is a int. So I realized I was mixing the types. So let’s force the page number to an integer, by using the Request::getInt() method. So there is not way we’ll be able to throw an Exception, since we don’t know that the value is invalid. It works! Since preg_match only works on string, it will automatically cast an integer to a string. Another solution is to use ctype_digits(), but we need to make sure that our default parameter is a string.